My first Liberty of London project is a simple one, but damn, does it ever make me happy. When I got my Nikon camera last year, the first thing I wanted to do was make myself a new camera strap. I cringed every time I looked at that black and yellow strap. I planned on making a new strap from scratch and this is likely one of the reasons why this project was so slow to get off the ground. As I thought about where I would get all the right hardware to do this properly last week, I realized that it would be much much easier to just re-cover the existing strap. Sometimes there’s no need to go building something from scratch when you can just hitch a ride on something that works perfectly fine. How could I resist having a posh Liberty of London camera strap? 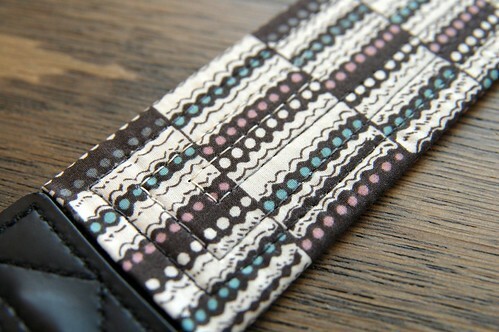 I chose the print called ‘Zain‘, which seems to be perfectly suited to being a camera strap, don’t you think? Since this project requires only a small strip of fabric (approx. 4″ x 20″), it hardly seemed painful at all to cut into this precious fabric. I cut the fabric along the selvedge so that I could use the finished fringe as my exposed edge. I ironed fusible interfacing on the back to make it a bit sturdier. Next, I pressed a small fold along the two short sides and then put a layer of ‘Steam a Seam 2’across the back of the fabric. I carefully wrapped the strip around the existing camera strap, overlapping the fabric with the selvedge edge showing. Using a hot iron, I pressed the fabric covering the strap to activate the ‘Steam a Seam 2’ and glue the fabric to the strap. 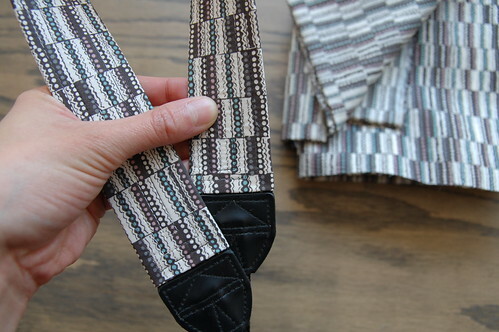 The last step was to sew/quilt concentric rectangles along the length of the strap to secure the fabric to the strap. I’m so happy. It’s the prettiest camera strap I’ve ever seen and it will be perfect for Paris. We leave a week today! I have been waiting for this project!! It turned out so perfectly! And I love the fabric for it! Karyn, you never cease to amaze me with your skills! That looks awesome. that looks amazing, karyn! also, so brilliant – i, too, hate my camera strap and am looking for a reason to put in some time behind a sewing machine. danke! i love it! what a great use of the pattern. it’s perfect for something long and strappy. That looks lovely – a definite improvement on the original one – and the fabric is fantastic. I love Liberty!! It turned out perfectly! And the Liberty pattern works so well with the quilted rectangles..! Oh, oh – that is so fabulous! And thanks so much for the explanation on how you did it! Karyn this is so nice. I hope, hope, hope you still have some fabric left by the time I return from my vacation. After this post I need a strap made out the red flowery material. Great idea! Love the new strap. oh, what a fabulous idea! 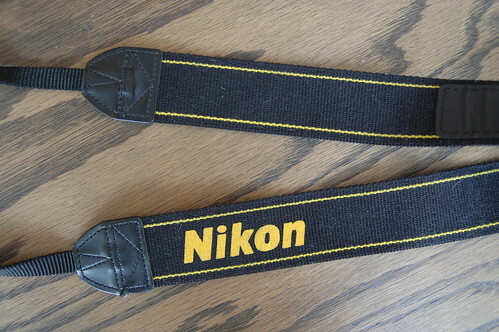 i’ve cringed many times at my nikon strap as well but never thought to cover it up. thanks for the inspiration! It is my first comment. First of all, I would love to have a place like yours in my city, I would live there. I love your dress collection. 13 dresses for summer…would have a great wardrobe. And secondly, enjoy a lot in Paris, you would love it. love it karyn. i know what my next project is going to be! Liberty… liberty… j’écris ton nom…. That fabric was the perfect choice!! The scale of the print, the colours, the style. You did it beautifully. I’m glad to hear I’m not the only one doing last minute craft projects before trips to beautify the practical. thanks everyone! i feel like this camera strap has changed my life a little bit! i’m so proud of it. claire – wait til you see the bag i’m still trying to finish for the trip… it’s almost done and i leave tomorrow!